Medieval Christian theologians had to understand Old Testament books such as Job in terms of Christianity. This need gave rise to a tradition of explanatory notes called the 'glossa ordinaria'. In some Bibles especially for theological study the glossa ordinaria were written around the biblical text in a frame-like arrangement. Additional notes on particular words would be written between the lines. These notes remained standardised through centuries of use. This copy of Job and the sapiential books (Proverbs, Ecclesiastes, Song of Solomon, Wisdom, Ecclesiasticus) with the glossa ordinaria belonged to the Franciscan convent at Canterbury. 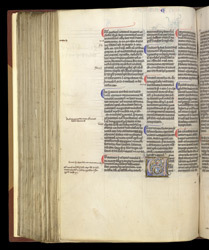 This page os Ecclesiastes is almost entirely covered with the glossa ordinaria from the preceding page, on the first sentence of the book. A red or blue mark indicates the beginning of each paragraph of the gloss. At the lower edge of the centre column, the large decorated letter signals the continuation of the scriptural text, which is written in larger letters. In the wide margins around the commentary, glosses on the gloss were added in tiny handwriting, while less formal notes were scribbled with metalpoint (a metal--probably lead--stylus, the early form of a pencil).